This gun works much better than the Senco guns I have, although I don't like the cord. Easy to change the depth, or size of the screw, tool-free. 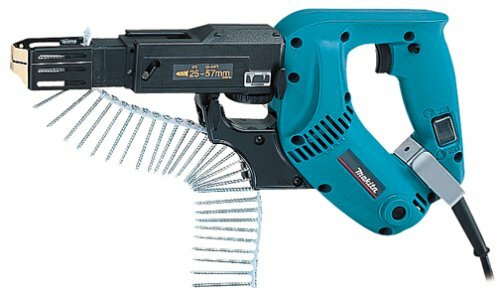 I have had the same problem as others, a lot of the Senco screws do not work with this gun, but the Pam fasteners work better than Makita collated screws. I was laying over 3000 sq ft of hardibacker. It seemed a perfect job for an autofeed screwdriver. 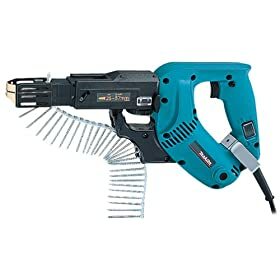 I bought a SENCO because my local store was out of the Makita. The SENCO couldn't sink the screws through the Hardibacker. I went to the local rental shop and got a professional version of the SENCO. It was better, but I still had to finish off setting every screw. Finally, I found this Makita. It handled the job perfectly. This product is very well made. Its construction is clearly heavy duty not like some of the other brands that I bought and returned. Drives the screws perfectly every time -- plenty of reserve power. All of the adjustments are on the tool and thus do not require external tools. I had no idea putting in screws could be this much fun. I'm doing a lot of renovation and this thing is absolutely amazing. There's no way I could do what I'm doing without it. Mind does jam once in a while. The way the screws get positioned prior to driving seems to work about 95% of the time which means that about every 20th screw the screw gets torqued sideways and I have to dig it out of the mechanism with my fingers. I can't seem to identify any technique that makes a difference here but maybe I need to drive another 1000 screws or so to get the hang of it. That said, and even with the downtime to fix hung screws, it is wicked fast. One not so good thing, in my opinion, is that it only comes with a phillips bit; a lot of the flooring screws I use are Robinson bits (square drive) and you need to order a separate bit for that ($7 as I remember but hard to find).